Your Matherplanet is suffered from invaders - extraterrestrials. Enemy aircrafts bomb the Earth. You are the last hope of the terrestrials. The best starship is prepared and well equipped. Don't lose the time, good luck! Your mission is rather complex. The number of ETs is great, they are very dangerous and aggressive but the most perilous are their bosses. Their aircrafts attack you each 20th level, in case you manage to reach it. 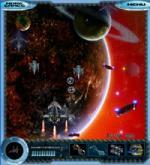 All your skill and deftness are necessary for you in this intergalactic war. Don't forget to fill up using special fuel stations.